Smoke Jazz & Supper Club – 2751 Broadway, NY 10025, $9 Cover. Carlos Abadie – Trumpet, Joe Sucato – Tenor, Peter Zak – Piano, Clovis Nicolas – Bass, Luca Santaniello – Drums. Jersey City born/Miami raised trumpeter Carlos Abadie is a disciple of the great Ira Sullivan and Melton Mustafa. 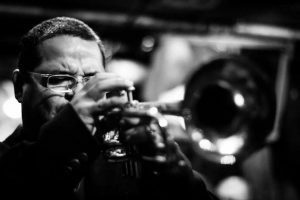 Abadie moved to New York City in the summer of 1993 where he frequented Smalls Jazz Club and University of The Streets. Mr. Abadie started his professional career with Jason Linder and his big band. Later on he went on to play with such greats as Junior Mance, Louis Hayes, Ben Dixon, Charlie Persip, Billy Hart, Benny Powell, Kevin Mahogony, Illinois Jacquet, Odean Pope, Ray Santos,Bobby Sanabria, Andy Gonzalez, Grupo Folklorico y Experimental Nuevayorquino, Conjunto Libre, Jerry Gonzalez, Steve Berrios, Nelson Gonzalez, Joe Ford and many more. Flash forward to 2014 Mr. Abadie has been holding down the Thursday late nights at Smalls Jazz Club with his quintet for the last 6 years. Mr. Abadie has released two out of four albums in a series he calls Immersed In The Quest, Vol. 1(Introducing) & 2 (Carlitoʼs Way) on Truth Revolution Records. Thanks to his new association with Curtis Brothers Music and Truth Revolution Records. One of New York City’s “Busiest Musicians” (NY Times) Cornetist Kirk Knuffke has been based in NYC since 2005. 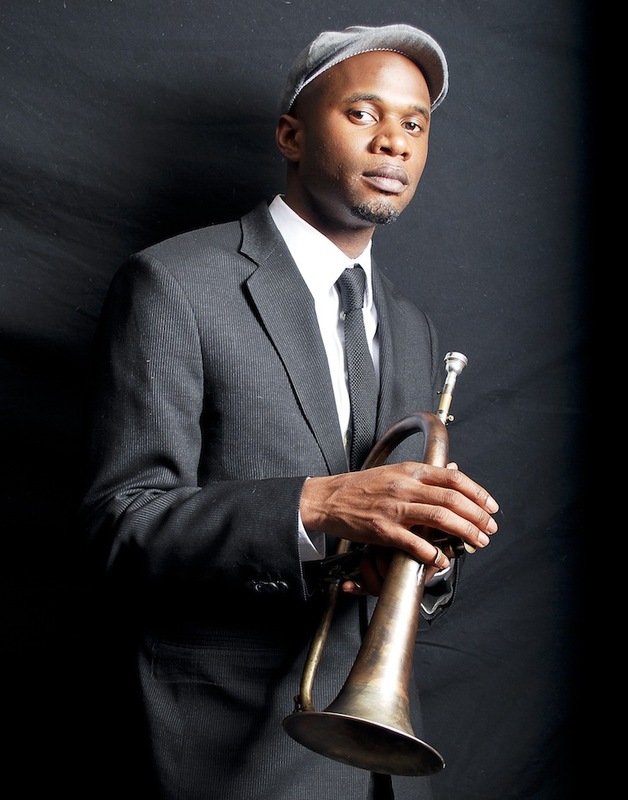 A largely self-taught musician, Kirk is listed as a “Rising Star” in the Downbeats Critics Poll for 2013 and 2014 and was one of 4 finalists for “Trumpet Player of the year” by the Jazz Journalist Association in 2014. 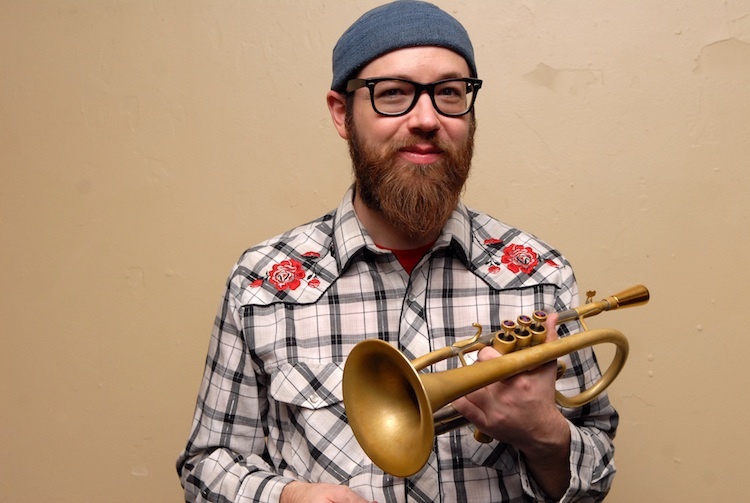 Kirk stays very busy as a member of the celebrated Matt Wilson Quartet, touring the US, performing and teaching. Kirk is featured on Wilson’s new recording of the Quartet plus John Medeski on Palmetto Records. Knuffke also plays in groups led by Mark Helias, Bill Goodwin, Michael Formanek, Myra Melford, Uri Caine, Todd Sickafoose and Allison Miller among many others. As a leader or Co-leader Knuffke has made 10 recordings for labels: Cleanfeed, SteepleChase, Not Two, Relative Pitch, and No Buisiness. The Kirk Knuffke Quartet CD “Chorale” is now available on Steeplechase records (with Michael Formanek, Billy Hart and Russ Lossing), It was featured in the sunday New York Times, with Times writer Nate Chinen saying it is “Excellent”. Leon Jordan Jr. -Trumpet, Anwar Marshall – Drums, Luke Orielly – piano, Rick Tate – Sax, Nimrod Speaks – Bass. Photo by by Shannon Adelson. 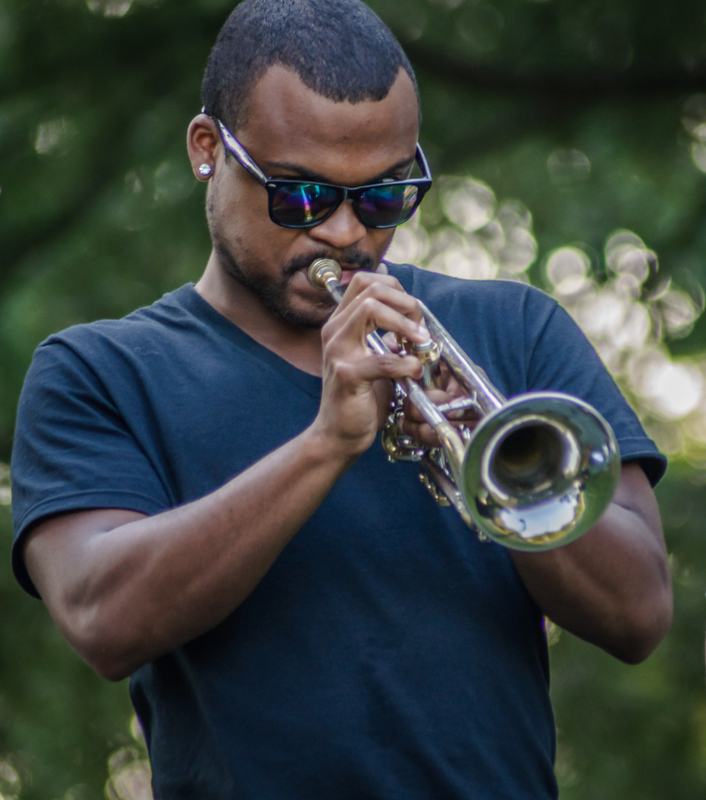 The 26 year old Trumpeter/ Composer Leon Jordan Jr is a Philadelphia Native who has studied music at the University of the Arts . Leon Jordan Jr has recorded two records as a bandleader including his most recent release “Breakout” that features Jazz luminaries such as Kurt Rosenwinkl and Gerald Veasley. He has recorded and shared the stage in a wide range of musical settings with Orrin Evans, Tim Warfield, Earth Wind and Fire, Michael McDonald , Maysa Leak, Kevin Mahogony, Kindred the Family soul and Musiq Soulchild and many more. Leon Jordan Jr has recently performed with Jeremy Pelt, Dave Douglas, Dr. Eddie Henderson and Randy Brecker on the United Trumpet Summit Tour. New music coming soon be on the look out! Theljon Allen – trumpet, Elijah Balbed Tenor – sax, Mike Saunders – bass, Salem Brown – piano, Josh Thomas – keys, Charles Wilson – drums. Theljon Allen is a Baltimore native, began playing trumpet at age 12. He attended New School University and Peabody Conservatory. Theljon has recorded or performed with Ledisi, Tye Tribett, Janet Jackson, Mary J. Blige, Cyrus Chestnut, Joel Holmes, Hinton Battle, and Ariana Grande. Theljon also released his first album called Universal Language which is available on itunes and Amazon. Theljon will be featuring his quintet on the 17th at the Font Festival.